I want to take the time to recognize all the hard work and sacrifice to run events. 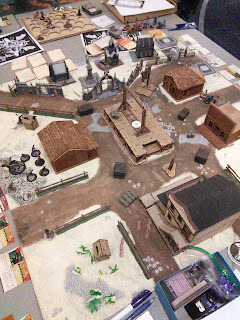 Thank you to all of the judges and organizers for cramming this much Malifaux awesomeness into a 4 day window. 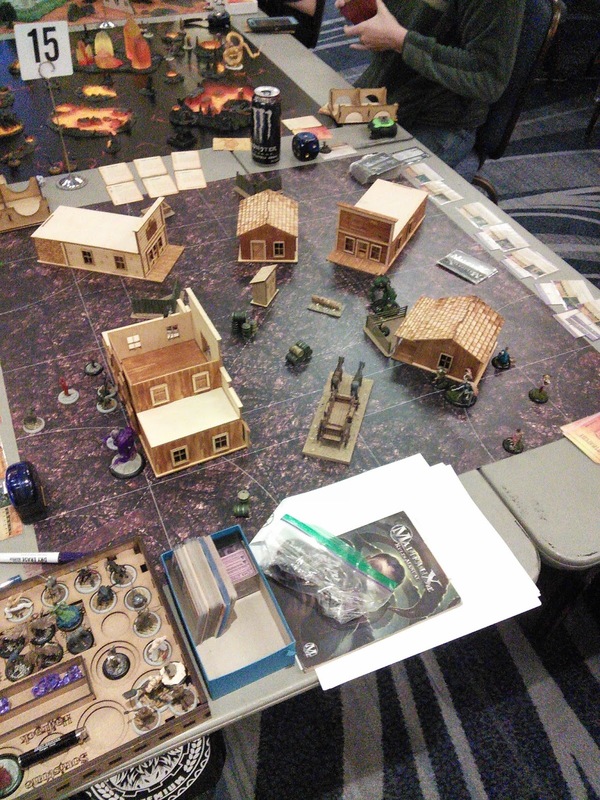 Thank you to the sponsors and Wyrd games for their tournament support. So last year before Adepticon I was more or less a casual player. 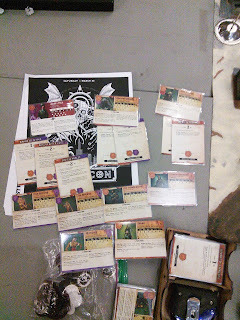 I would play Adam on Vassal and maybe dip my toe in GenCon tournaments (since that is the first con on my calendar every year and I'm going to be there anyway). Then one day Curtis (a guy I never met until I got in his car to drive 13 hours to Adepticon) gets on our local facebook group and asks if anyone was interested in going. 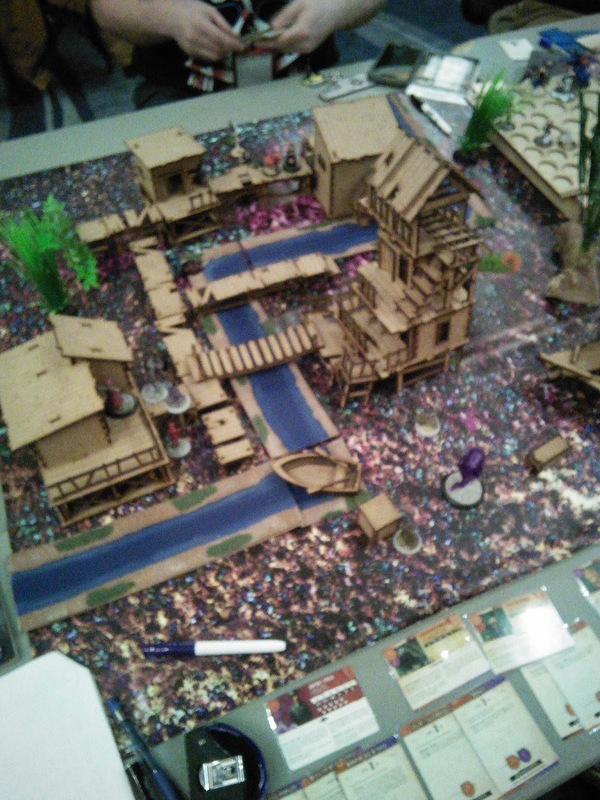 So we set up the trip kinda at the last minute and the Wandering River Dojo was born. Lifetime hours hanging out with Curtis 96ish (if you discount sleeping in a shared room and playing at different tables in an event) and more than half of those hours are driving to and from exotic events. I could use more friends like him and I'm sorry he couldn't make this trip. Needless to say this trip was kinda of in a state of flux up until Curtis informed me he couldn't make it. I wanted to fly and I was almost willing to buy him a ticket so we didn't have to drive and time not in the car is time spent playing the games. I got to ration my time off to attend all the events I make it out to. So I got a hold of Chris and his room situation was kinda at capacity but he was going to make it work. I had this gut feeling I should just get my own room for this trip. Not sure what it was but it was kinda intangible and it felt good to come and go without worrying about other peoples schedules and such. Bonus is it helped me locate a 7-11 for my hydration needs. Part of my decision for getting my own room is I would dictate how much sleep I would get. Or so I thought. I don't know what it is about this game we play but when I am done my brain tries to think of all of the things I can do to play the game better. Resource economy, synergies, how to handle tricks my opponent(s) used in the future... and so on. Needless to say restful sleep for the most part didn't happen until tuesday after I got home. Just the bare minimum to function. Better than getting up at 4 am and driving 6 hours to play since distance driving in itself is an endurance test so for the most part I was ready to play. Normally I will think ahead and bring snacks because it's better to have them and not be hungry than the alternative. But the convention center food service was 30 seconds from where we were set up so in between games if I wanted something it was right there. I bought tea and used the bottle for water the rest of the day. So what I am trying to say is it is better to know that these out of game basic human functions are covered because if your body is suffering from hunger, sleep, over or under dressing, and such it can sometimes subconsciously affect your personality or slow down your decision making. Maybe I'm just getting old and beginning to feel it but I figure I would pass along what little wisdom I have on such topics. Also con crud is a thing. If you have an 'I feel a cold coming on so I better get ready to attack it' plan be prepared to implement it at the first sign even if you are over reacting. Arrive early if it is within your ability to do so. The flip side is have a list you know like the back of your hand that you can put on the table and be ready to play 2 minute after you walk in if you are pulling up at table announcements. Know who your TO(s) are and communicate any change of schedule. Being early gives you time to organize your thoughts and make sure you have everything you need to play. I recommend buying or making a tray. I always use to see people using them and thought they look nice but it is way easier to get to the next table if you put everything you need on your tray. Admittedly I got my tray for playing in the TFL and attending the TFL tournament (add link) but had I knew before I got mine for free how convenient having one was I would have bought one. When I say free I imply if I exclude the travel expenditures since I was going anyway. I feel you should have all the models you might possible summon or use within arms reach and ready to go as well as the cards to use them. I also just learned there is such thing as option overload. 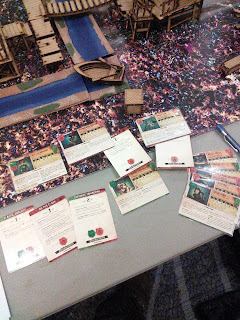 Example... while playing in a campaign terracotta warriors can flip an upgrade to any campaign upgrade legal for the target to start with at the beginning of the game much in the same way summoners can pull in model not in their arsenals. If what you want to do is not committed to memory make a cheat sheet. If I want to damage I want X and Y and what need to happen to do it. If I want to run schemes do A or B and need this and so on. Sometimes you will find making the cheat sheet is kind of like taking notes in class and the action of writing it down helps you learn it. The less time you spend reading your cards is the more time you can spend playing the game or finishing faster. Sometimes I find myself weighing options I don't have available trying to find a way out of a situation I might be missing. At the end of the game you ought to respect your opponent if they out played you. All of this rambling is basically saying is be mindful of time. If given the choice I prefer games that finish to games that get cut by the clock. 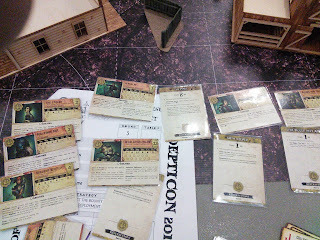 Masters of Malifaux 2017 at Adepticon quick and dirty recap. I did most of the lists with pictures. I will probably continue this method and try to improve it in the future. If there are any questions on any games I will try to answer to the best of my ability. I intended to save the names off the best coast pairings app but I don't know how to go back to a previous month for data or if that is even an option. I will remember to screen grab those next time. So my plan was to have Huggy tell Nekima to give me points for Frame and then Lynch would get me Quick Murder. I put the Effigy in for padding since Leader was a potential target. I figured if I could weather the potential assault I could counter punch my way to a win. 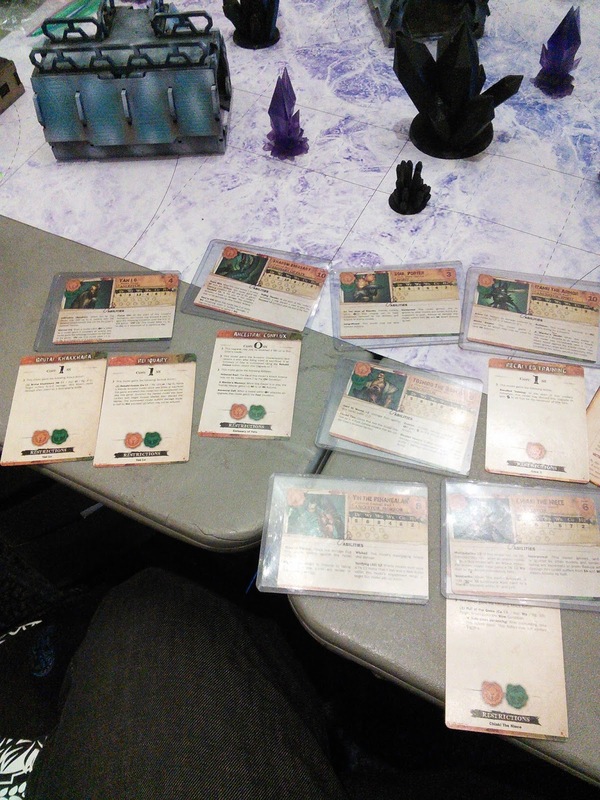 I made Yin my 'quick' target so I could limit his scheme selection. I think he opted for Hunting Party if memory serves. 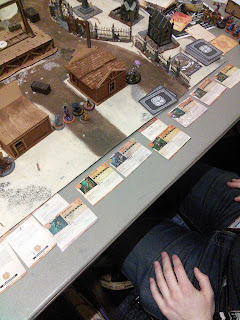 I put the Effigy on 1 wound probably telegraphing my Frame target. 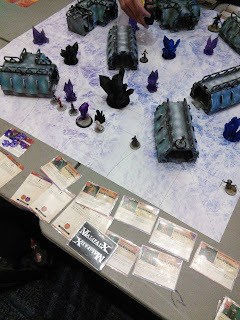 Nekima came in as predicted turn 2 and parked where it would bleed on Lynch, the Effigy and the Terracotta. So I sent huggy in to delete her knowing I was probably trading points but I was getting at least 7 (Quick, Frame by bleeding, and a head marker) to his potential 3 so I was good with the trade. The voodoo doll had a hard time landing hex on Yin. Spent 3 turns trying and it finally landed. Then Iggy did his thing but by then I had 3 heads and cruised to a 9-6 victory. So McCabe vs Asami. I think this was my favorite game of the whole convention. I found a way to play vs a summoner, deny, and score interference all in the same turn with a non summoner. Granted this will become way easier when Sun Quiang finally gets a model. The plan fell apart when I tried to flip an upgrade into a second Badge of Speed after I moved the first one off McCabe. We called the judge and he ruled against me. I think the decision was fair and I played on but I now had a model out of position and I wasn't able to recover. It was a hard fought match but inevitably I lost 5-7. Things that worked. 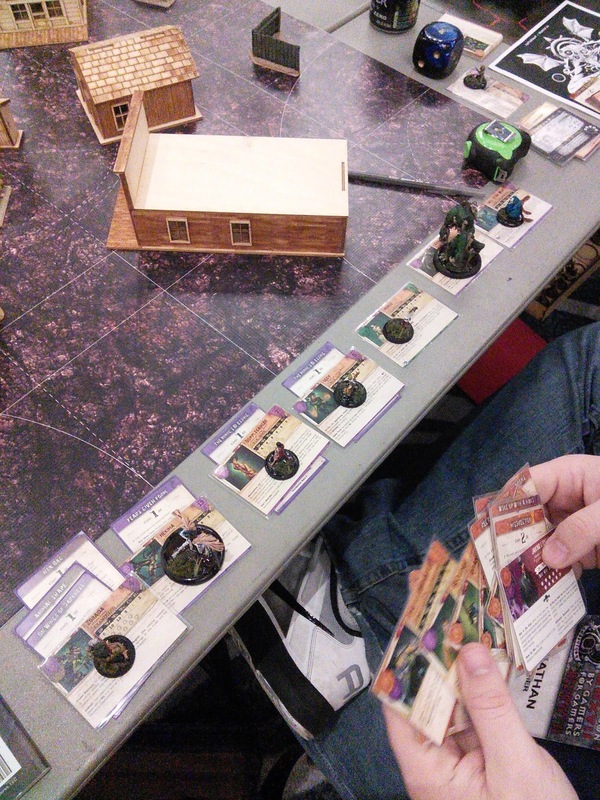 Sadir shooting the bad guys and milling the deck to get all 4 aces. Beckoner showing McMourning the goods and made him come running. Pay for Blood 2 damage. Final debt 10 damage. 52 Pick Up 8 damage. No more McMourning turn 1. Things that didn't work. Selecting the wrong Frame target on my side(but still scored 3). Sadir shooting all the bad guys and giving away Frame turn 3. Underestimating Phiona on a squat marker Steve was holding. My deck going cold so the nurse could more or less neutralize Lynch. Phiasco gaining evidence +2. Somehow managing to lose this game 6-9. This game will change the way I approach the game in the future. I'm pretty sure my list was the same from game 4 and I was back on the table I played at round 1. So Hamlin is a pain in the rear if you don't have an answer for the rats. Need to include long range blasts and/or Misaki. It was near impossible for me to maneuver to score Bounty. I did ok on my schemes but it wasn't enough. 5-7 loss. Story encounters on Sunday. I was worried if I played all 3 games that I would possibly miss my flight and be screwed because I needed to be at work Monday morning. 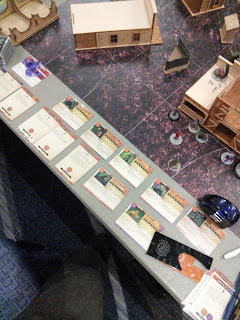 These games are generally a little chaotic but they almost always have optional rules for scoring so each story is more or less different in that regard. I went 1-1-1. I didn't take many notes (mental or otherwise) due to sleep deprivation but I will endeavor to do better in the future. Adam and I will be hosting a 50ss tournament in Blacksburg Va. Saturday April 22nd. $5 admission. 9am check in, round 1 starting at 10. I will be running a team tournament at Giga Bites in Marietta GA July 1. 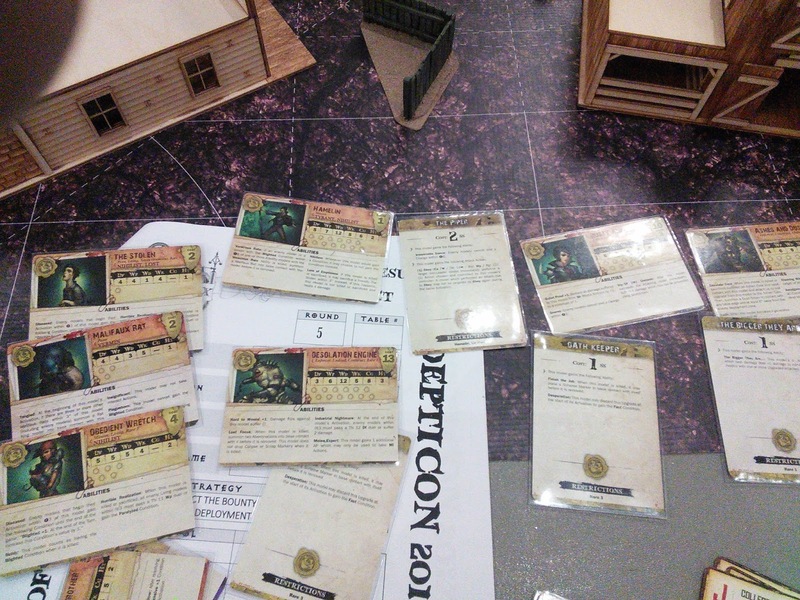 It will use the same format as the team event at Adepticon with only slight changes if any. It will likely be 3 rounds. Details will be posted to Georgia Malifaux and Southeastern Malifaux facebook groups when I have them. In the meantime, don't forget to visit our our sponsor's website Leodis Games. Pre-orders of Malifaux items are 20% off. They are one of the best distributors in the UK, and they'll do right by you, and kick a little bit of support our way in exchange. So go check 'em out!